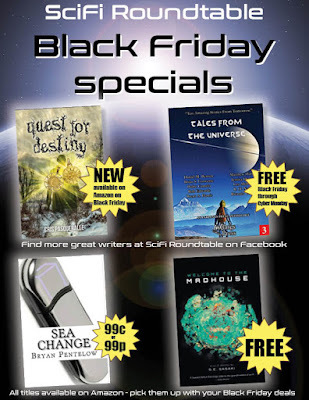 For Black Friday, Inklings Press has teamed up with several other writers from the SciFi Roundtable group to offer readers some bargains! You can pick up the third book of Cris Pasqueralle's ongoing series, available from Friday. Bryan Pentelow's Sea Change is available for just 99c or 99p. S E Sasaki's Welcome To The Madhouse is available FREE. And the Inklings collection Tales From The Universe is available free from Black Friday through to the day after Cyber Monday. Follow the link below to pick up your copy.